Although well publicized by the press, these so-called national defense features were, with the important exception of speed, compartmentation, and extended endurance, only marginally helpful in preparing these ships for use by the navy. 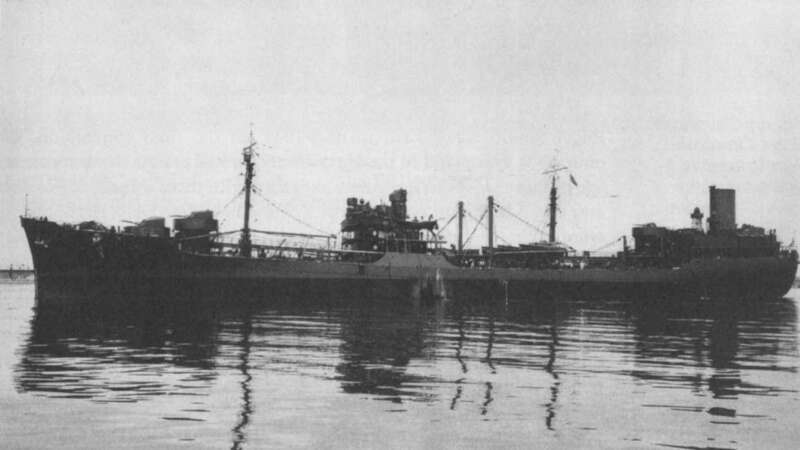 In the course of time each of the tankers acquired from the maritime commission would be extensively modified and armed in various navy yards. For ships obtained before the Pearl Harbor attack, these changes were usually made in a series of stages beginning at the time each was first taken over by the navy. 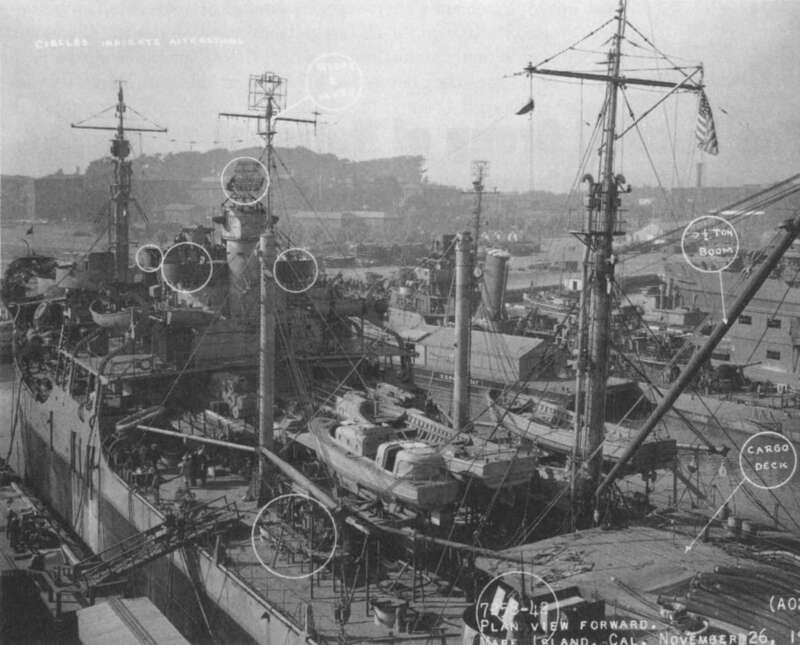 Because of the urgent need to transport oil to the rapidly expanding naval base at Pearl Harbor, the Cimarron and the Neosho were commissioned as soon as possible, but were not extensively modified prior to service. Only those changes necessary to bring the ships up to navy standards were installed at that time. Platte was the first of the T-3s acquired from the maritime commission to be extensively modified for service as a fleet oiler.6 After commissioning, she spent the early months of 1940 at the Philadelphia Navy Yard undergoing preliminary conversion. 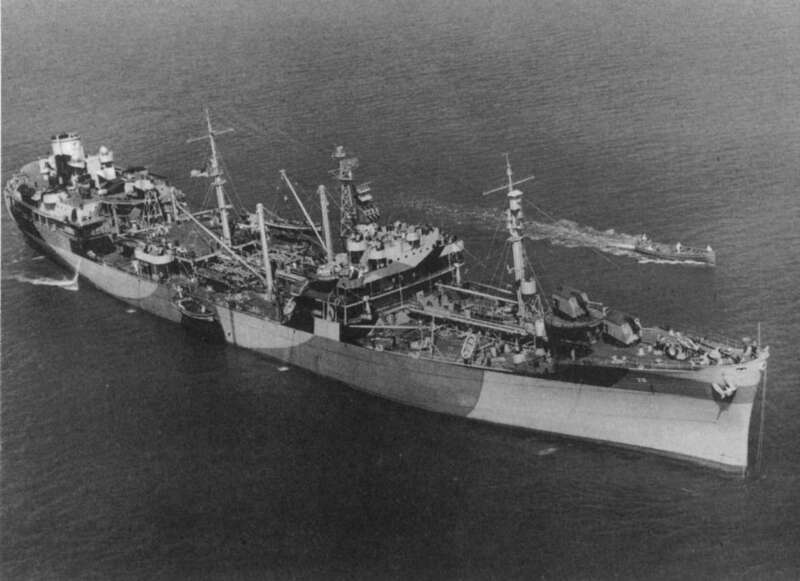 Major alterations made to the ship while in the care of the yard included changes and/or additions to (1) mess and berthing facilities; (2) fueling at sea facilities, including gear for heavy ships; (3) towing installation; (4) stowage and handling arrangements for cargo fuel oil, gasoline, diesel oil, and lubricating oil; (5) accommodation ladder; (6) navigation equipment; (7) signaling equipment; (8) searchlights; (9) [naval] radio; (10) life buoys; (11) ground tackle; (12) provision for darkening ship, telephones, man overboard, steering, blinker circuits, etc. ; (13) arrangements of offices, storerooms, and service spaces; and (14) boats and boat-handling facilities.7 There is no evidence to indicate that any armament was installed, however, and no magazine spaces or fire-control equipment appears to have been fitted at this time. On the contrary, records found in the files of the Bureau of Construction and Repair indicate that the question of how these tankers were to be armed had yet to be decided. battle damage was always of great concern to the board, which exercised great influence in this area and was frequently responsible for the ultimate decision regarding the size and number of weapons carried, the type of fire control to be employed, and the amount of armor required in a given class or type of vessel. The General Board was well aware of the funding difficulties anticipated for the auxiliary building program and advised that savings could be made by "deferring the installation of the remote control features of the battery and the high powered searchlights until such time as funds become available. "12 The General Board did state, however, that provision should be made for the future installation of these items.13 If further economies were necessary, the General Board suggested the temporary installation of "five-inch guns already on hand, and such fire control equipment as can be afforded," until funds were available to purchase new equipment. In early January 1940, the General Board was asked to review the battery and fire-control equipment intended for installation on the Cimarron, Neosho, and Platte as part of their final conversion. The three oilers were among ten new auxiliaries recently ordered by the navy: Cimarron (AO-22), Neosho (AO-23), Platte (AO-24), Dixie (AD-14), Prairie (AD-15), Vulcan (AR-5), Fulton (AS-11), Terror (CM-5), Curtiss (AV-4), and Albemarle (AV-5). The Bureau of Construction and Repair expected all to be armed with 5-inch, 38-caliber, dual-purpose guns and planned to install the Mark 37 fire-control system then entering service with the fleet. In 1940, this combination of weaponry was the most advanced antiaircraft system in the world and was far superior to that of any other navy. 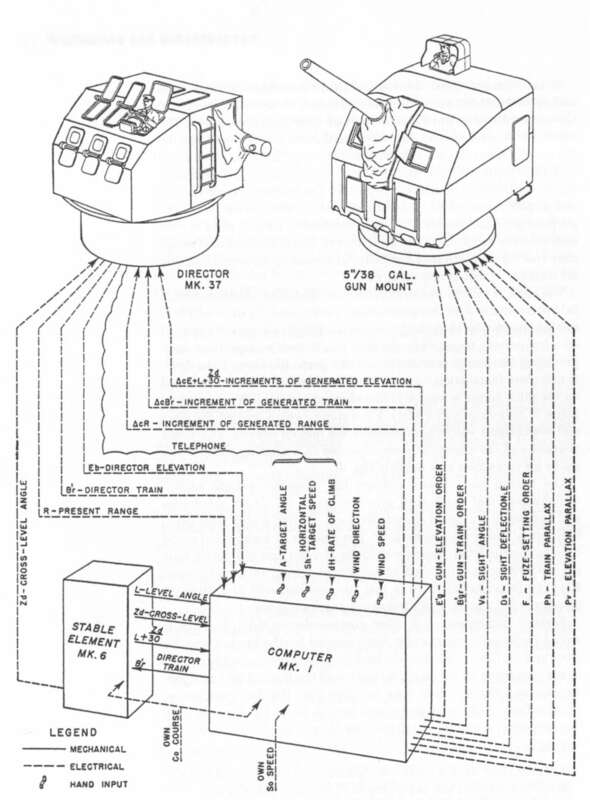 The Mark 37 system was an extremely sophisticated electromechanical fire-control system that automatically computed the necessary corrections needed to keep the guns and searchlights accurately trained on a fast-moving target while the ship was in motion, simultaneously providing the proper fuze settings to the projectile about to be fired. A complete installation consisted of the Mark 37 director mounted on the pilot house, a Mark 6 stable element to establish a horizontal plane of reference, and a Mark 1 computer, which trained the guns and searchlights electrohydraulically via remote control. The stable element and the computer were mounted in a plotting room below decks for protection and stability (fig. 9). The bureau had already ordered the necessary remote control switchboards and fire-control gyro compasses for all ten auxiliaries and had begun wiring all except Dixie and Curtiss, which were being built on a "limited funds basis. "14 The amount of money that could be spent on the latter vessels was limited by law and did not include the $353,000 price of the Mark 37 fire-control system nor the additional $34, 250 for installation. Note that the installed cost of a Mark 37 director was 12 percent of Cimarron's purchase price! It is noted that the fire control equipment proposed is of the latest design and appears out of proportion to the type. There is no objection to its installation, but in view of the fact that many combatant ships have installations inferior to that proposed for the Cimarron it is considered that they should be given preference. Adm. Harold E. Stark, then CNO, forwarded Richardson's comments to Secretary of the Navy Charles Edison who asked the General Board to study the recommendations.16 Before holding a hearing, Adm. J. W. Greensdale, chairman of the General Board, asked the chiefs of the Bureaus of Ordnance, Engineering, and Construction and Repair their opinions "as to the relative merits of the standard remote control. "17 The responses received by Admiral Greensdale are of interest because they show what the various bureaus were thinking and illustrate how decisions were reached within the navy's hierarchy. on all combatant ships recently constructed, and the increasing familiarity of personnel with the system, the upkeep on auxiliaries should not involve insurmountable difficulties. of a roller path (as opposed to a pedestal mount) eliminated the need to have ready service ammunition boxes near the guns (a dangerous practice that the navy preferred to avoid if possible) and allowed the use of a power-operated ammunition hoist that automatically set the projectile fuze as it was lifted from the handling room to the gun compartment. This was an extremely important feature for a weapon intended primarily for use in antiaircraft defense, since it eliminated the added error inherent in manual fuze setting (fig. 10). The Mark 37 fire-control system was also installed during the ship's protracted stay at the Philadelphia Navy Yard. 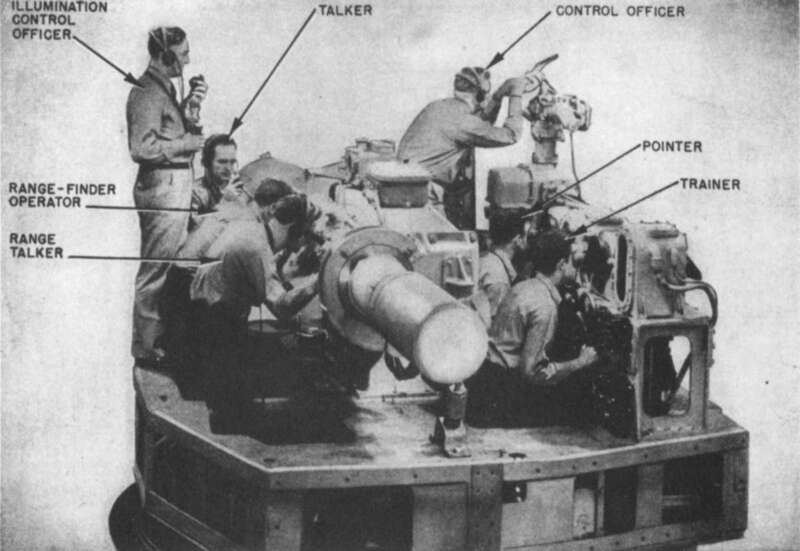 It consisted of two main elements: a topside director and analog computer below decks, which calculated fire-control solutions that were automatically transmitted to the individual gun mounts and fuze setters. 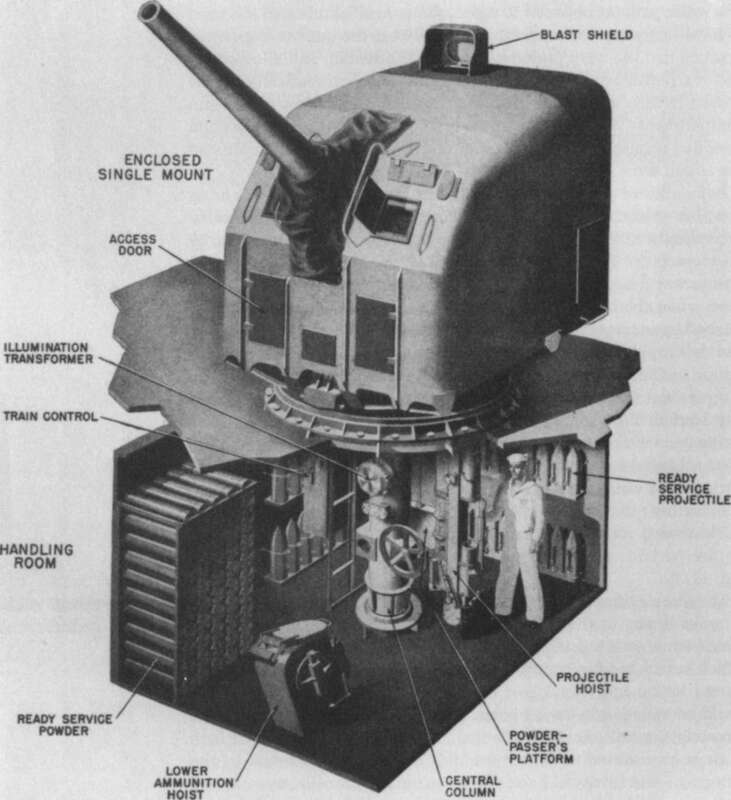 The system could be operated in three modes: (1) Fully automatic--all functions remotely controlled; (2) Semiautomatic--train, elevation, and fuze settings transmitted to the mount and "matched" to pointers by the gun crew; and (3) Local control--for manual control in the event of power loss or battle damage. The director was mounted on a 9-foot diameter steel cylinder atop the pilot house and was connected to the computer by a series of cables that ran through an armored tube positioned just aft of the main deck. The armored tube terminated in a plotting room situated within the island structure on the main deck. Fire-control circuits, remote control switchboards, a battle announcing system, and an underwater log were also included as part of the fire-control system.25 The entire installation--guns, mounts, director, and fire-control computer--was the latest and most up-to-date of its type then available. A secondary battery of eight .50-caliber machine guns was also mounted at this time. The guns were placed in pairs on both sides of the pilot house and on top of the after deck house. Those on the after deck house were mounted in echelon to provide a better volume of fire against attack from astern or either quarter.26 All machine gun mounts were surrounded by vertical shields of armored steel.27 Two 36-inch searchlights equipped for high-angle searching were also included as part of the armament. These were mounted on elevated platforms atop the after deck house and fitted for remote control from the Mark 37 director. Two other items classified as ordnance were the paravane gear (carried for mine sweeping) and the degaussing equipment. Details for the latter had yet to be developed and it was, therefore, not likely that it would have been installed on the Cimarron at the time she first underwent conversion in early 1941. Puget Sound Navy Yard in mid-1941 for her final conversion, the enormous expansion in naval construction had created a severe shortage of these weapons and she was armed with three 3-inch, 23-caliber and one 5-inch gun on her stern.32 Sometime after Pearl Harbor these were exchanged for the new 3"/50s and a 5"/38.33 Because of difficulty in obtaining 5-inch, 38-caliber guns and Mark 37 directors, the Antiaircraft Defense General Board recommended the adoption of four 3"/50 guns with a simple director and the follow-the-pointer system as the standard antiaircraft battery for these ships.34 This recommendation must have been adopted since the standard armament of all future oilers commissioned prior to mid-1943 included four 3-inch guns and one 5-inch gun. gun raised gun tubs (port and starboard) installed on the main deck. A pair of 1.1-inch machine cannons, each controlled by a Mark 51 director, were also installed on the after deck house, replacing the .50-caliber machine guns originally intended for that location. 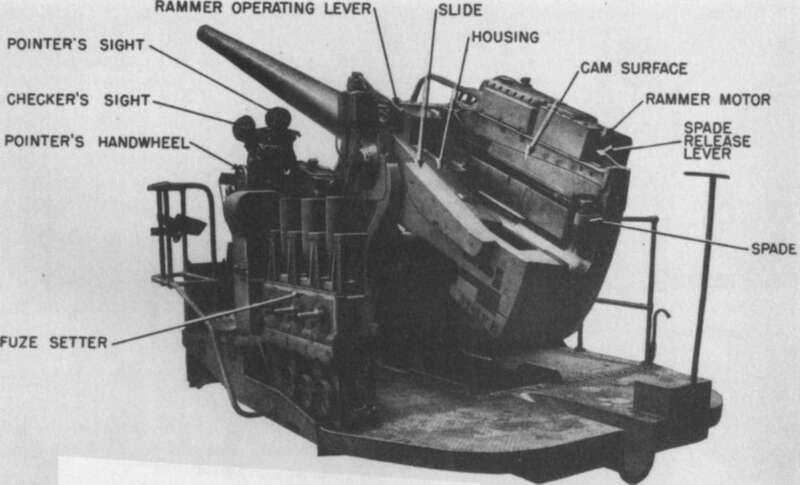 This arrangement, or some variation thereof, became the standard oiler armament until 1944 when the Bofors twin 40 mm gun began to replace the 1.1-inch cannon on a one for one basis. By December of that year, still more AA guns were being fitted to the latest oilers of the Ashtabula class so that the total armament aboard these ships consisted of one 5"/38 dual-purpose gun, four 3750 AA guns, four 40mm AA guns, and eight 20mm AA guns.